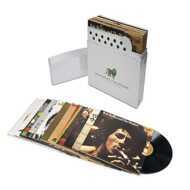 The Complete Island Recordings includes 11-LPs packaged in a rigid card box with lift top lid, and wrapped in silver paper that simulates the brushed metal finish of a flip-style lighter. The box includes Bob’s 70th Birthday logo and all nine Bob Marley & The Wailers studio albums recorded for Island Records, featuring some of their most celebrated releases, including Catch A Fire, their 1973 label debut, and Rastaman Vibration, their 1976 breakthrough album in the United States, along with two live albums Live! and Babylon By Bus.